It's a one-off five-passenger sports van that still has lots of cargo space. We don't have much occasion to talk about the Mercedes-Benz Vito. It's understandable since most people tend to embrace the more glamorous side of the automaker. Then again, the Unimog is world famous, but the Vito doesn't have quite the same jaw-dropping off-road chops. It can, however, haul all kinds of people and/or cargo, and occasionally a company like Vansports endows the van with a cool upfit. That brings us to this white sports van, which is awkwardly called White SportsVan by the Vansports team. The company has a long history with tweaking Mercedes vans, and this time around the attention went to a Vito 119 Mixto. The obvious difference is the flashy exterior, which gains a modest aero package with side skirts, a sporty rear fascia with a double-exhaust tailpipe sticking through, a roof spoiler, and lower lip spoiler up front. 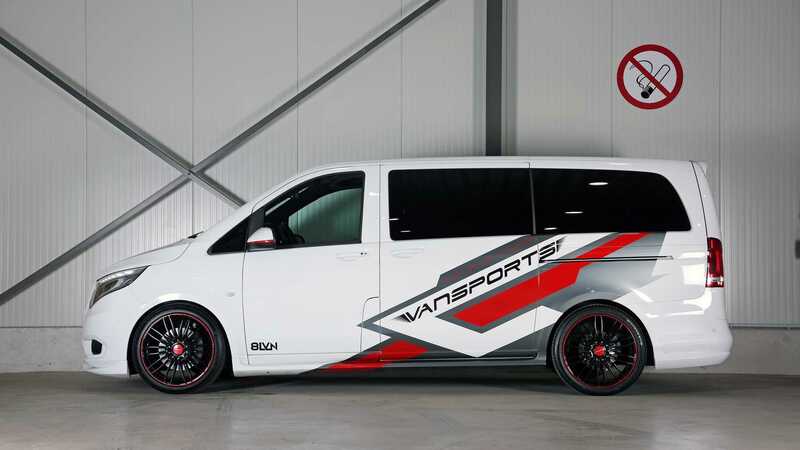 White is the predominant color – hence its clever name – though Vansports applies a red/gray wrap to help promote the company. You'll also notice the wheels aren't standard-issue Vito. In fact, they're 20 inchers shod with rubber-band-spec 40-series tires in front, and 35-series in the rear. A one-inch suspension drop helps eliminate wheel gap while also giving the van a bit of swagger in the corners, and the tuner also adds 30 additional horsepower (22 kilowatts) under the hood, though we're not told exactly how. Perhaps of more interest to van buyers is the interior. It's not decked out with televisions and comm gear to talk to satellites orbiting Mars, nor is it ready for a weekend camping adventure. It does seem rather posh inside though, with an abundance of diamond-stitched black leather and contrast stitching that delivers an upscale feel. This large van remains a five-seater, and the rear cargo area is fully finished with carpet and lots of black trim. In short, it's ready to work or play. Vansports has no plans to produce move Vitos like this one. 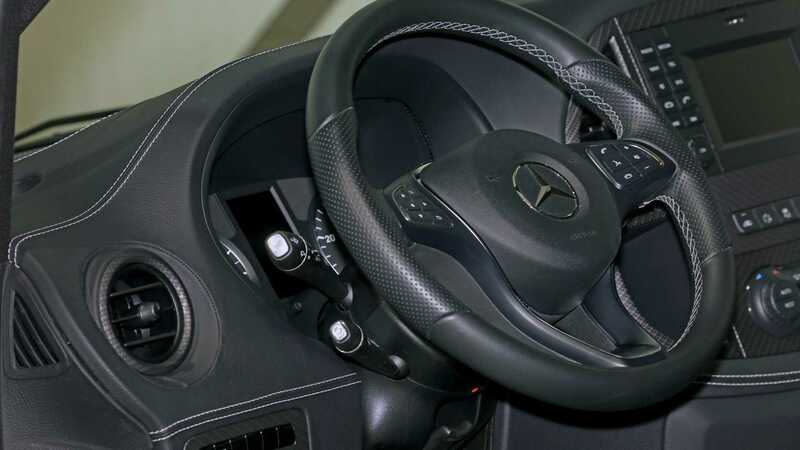 Its one-off mission is to help draw attention to the company and the other Mercedes upfits it can perform. In that mission, we'd say the Vito is a success.